Over 25 short video tutorials are available for the new, and experienced conveyor design engineer. Each tutorial focuses on a specific topic such as “vertical curves”, “feeder belts”, “reversible conveyors”, and much much more. Sidewinder was developed from the ground up using the latest software development tools and years of conveyor design experience. The program can handle conveyors of any length, geometry, and drive configuration. It incorporates a wide range of conveyor design calculations from both international standards and many published technical papers. Whether you’re new to conveyor design, or an expert with years of experience, Sidewinder will help you optimize your conveyor design in order to prove a safe, reliable, and economical system. If you are in need of a conveyor design package, or you are tired of struggling with your existing software, give Sidewinder a try today. The full 5 hour tutorial series can be downloaded here, or you can watch all the video online from the AC-Tek You Tube web site here. 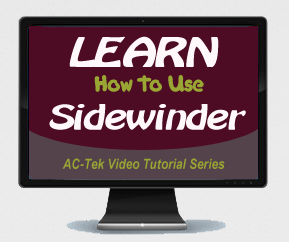 Our users have found that these tutorials are an excellent way to quickly become proficient users of the sidewinder software. The tutorials can be played using Windows media player, and stored on the user’s PC for quick and easy access.